This is an ancient breed. It has been theorized that an early Tibetan dog is the ancestor to all Molossus breeds, although this is disputed by most experts. A highly questionable study at Nanjing Agricultural University's Laboratory of Animal Reproductive Genetics and Molecular Evolution in Nanjing, China, found that while most common dog breeds genetically diverged from the wolf approximately 42,000 years ago, the Tibetan Mastiff genetically diverged from the wolf approximately 58,000 years ago. In the early 19th century, King George IV owned a pair of Tibetan Mastiffs, and enough of the breed were available in England in 1906 to be shown at the Crystal Palace show. However, during the war years, the breed lost favor and focus and nearly died out in England. After 1980, the breed began to gain in popularity worldwide. Although the breed is still considered somewhat uncommon, as more active breeders arose and produced adequate numbers of dogs, various registries and show organizations (FCI, AKC) began to recognize the breed. Since AKC recognition, the number of active breeders has skyrocketed, leading to over-production of puppies, many of which are highly inbred and of questionable quality. Initially, the breed suffered because of the limited gene pool from the original stock, but today's reputable breeders work hard at reducing the genetic problems through selective breeding and the international exchange of new bloodlines. However, some few breeders cling to the practice of inbreeding, do not perform health tests on their breeding stock, and do not support buyers of the puppies they produce. Many puppies and adult dogs end up in shelters and in rescue situations. 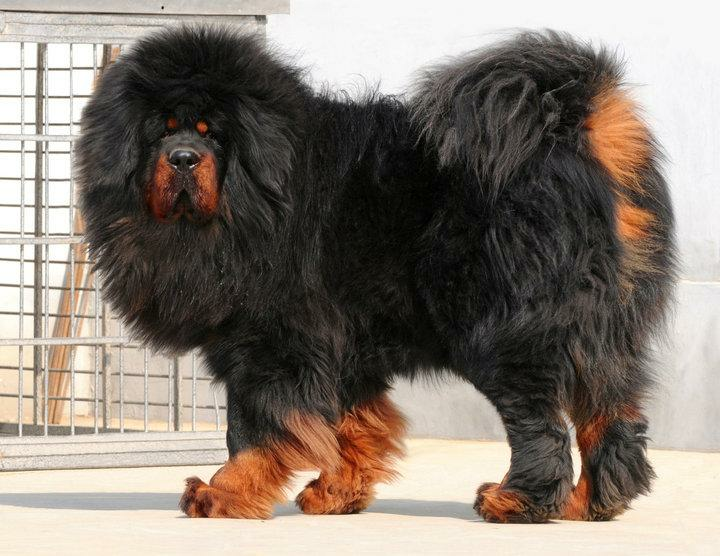 In 2008, the Tibetan Mastiff competed for the first time in the Westminster Kennel Club Dog Show. A Chinese woman was reported to have spent more than 4 million yuan to buy an 18-month-old purebred male Tibetan Mastiff, which she named Yangtze No. 2. In March 2011, a red Tibetan mastiff was reported to have been sold to a "coal baron" from northern China for 10 million yuan. There have been other similar reports of dogs sold for astronomical prices; however, most of these appear to be breeders' attempts to drive up the prices of their dogs. Photos of dogs shown on web sites are frequently photoshopped to exaggerate color intensity, size, and "bone". By 2015, due to copious production by breeders and unsuitability of the breed as a pet in urban situations, prices in China for the best dogs had fallen to about $2,000 and lower quality and cross-breed dogs were being abandoned.